Dr. Mamdani is a clinical researcher with interests in observational epidemiology and randomized clinical trials. Dr. Mamdani is the founding Director of the Applied Health Research Centre (AHRC) of the Li Ka Shing Knowledge Institute of St. Michael’s Hospital in Toronto. The AHRC manages over 100 clinical research studies in a wide variety of clinical areas, which include clinical trials and prospective patient registries, in over 30 countries worldwide. The AHRC is in the initial phases of designing and implementing clinical trials of stem cell therapies. 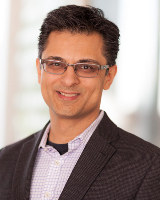 Dr. Mamdani is also the founding co-principal investigator of the Ontario Drug Policy Research Network (ODPRN) which bridges clinical research with healthcare policy by rapidly generating policy-relevant research using large healthcare administrative databases and rapid reviews for engaged policy decision-makers. The ODPRN has influenced numerous drug policies, influenced legislation, and had a tangible impact on the healthcare system.